Every year when EA’s E3 conference comes around, we all know what we are in for. An array of annual sports titles bookended by a major AAA title. Going into this year’s conference, the majority of the hype was built around Star Wars Battlefront and finally seeing the game in action. Many gamers were also keen to see where the latest instalment in the Mass Effect franchise was at in development after last year’s brief, behind the scenes video. Could EA’s big guns deliver after a tepid showing last year? EA wasted no time in showing off a new trailer for the latest Mass Effect, now titled Mass Effect: Andromeda. The brief, yet exciting trailer showcased an all-new mako in action, along with a beautiful looking western style planet that is set to be a part of the new galaxy that players will be exploring. The latest in the Need for Speed series (a full reboot of the franchise) was talked up as being the definitive NFS game. The gameplay shown looked visually impressive, especially the drifting which utilises a drift cam and gives off quite the cinematic feel. The new (free) story expansion for The Old Republic is set to take the game back to the old school BioWare roots in terms of storytelling. The great CG trailer shown told the story of two twin brothers, destined to end up on opposite sides of the force. The expansion will increase the game’s level cap to 65 and allow players to jump straight in using an included level 60 character. One of the surprise highlights of EA’s conference came from their new IP Unravel. The physics based platformer stars Yarny, an anthropomorphic creature made of yarn, using said yarn to traverse across a beautiful looking world. This is certainly one to keep an eye on, as from the trailer shown, it looks terrific. The sequel to last year’s Plants vs. Zombies: Garden Warfare showed off a new 4 player co-op mode and new classes including the imp. Admittedly it looks very similar to the first game, so this is one that those that enjoyed the first are likely to enjoy. We got the usual sports portion of the conference, with NHL 16, NBA Live 16, Madden 16, Rory McIlroy PGA Tour and FIFA 16 all shown. Information on NHL and PGA Tour was kept very brief, whereas FIFA, Madden and NBA were noted as controlling better than ever before. Game Face HD, the new face scanning app for NBA was shown off, with it being mentioned that the technology works ‘easily’. 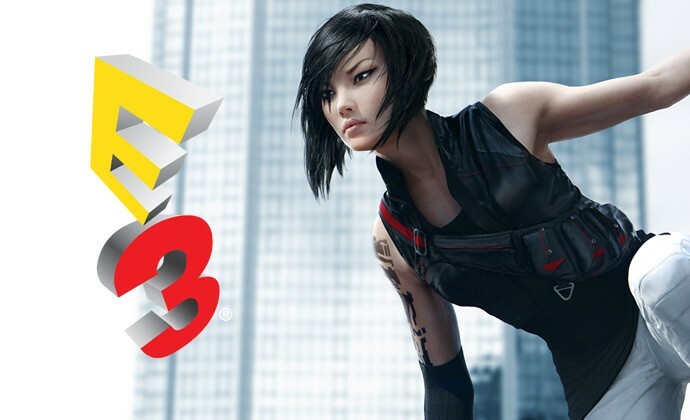 We finally got a good, solid look at the gameplay and an idea of the plot for the Mirror’s Edge prequel, which is set to be an origin story for the game’s protagonist Faith. The biggest surprise was the reveal that the game is ditching levels and loading screens, and is in fact going to be open world, which the parkour gameplay is going to benefit from big time. EA closed the show with their main draw and it did not disappoint. Showing off a battle on Hoth, we got the opportunity to see a variety of different types of gameplay. From firefights on the ground (in both first and third person) to thrilling dogfights, everything looked sensational. The footage concluded in epic fashion courtesy of appearances by Darth Vader and Luke Skywalker on the battlefield. While the lack of a campaign is still disappointing, the news that there will be missions that you can undertake both solo and in (split-screen) co-op has somewhat helped to soften the blow. Overall it was the usual kind of conference we are used to seeing from EA. The sports section always brings interest down, however the highlights here were a genuine pleasure. Battlefront looks terrific, Unravel is sure to surprise players and Mass Effect: Andromeda and Mirror’s Edge Catalyst currently stand as the two biggest and most exciting EA titles for 2016.